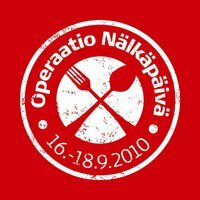 The Metropolia Charity team are putting together the final preparation for Operation Hunger Days. The plan is to launch the fundraising Tomorrow morning, Thursday 16th at 08:00 in Myyrmäki campus and also outside Myyrmäki shopping Centre. Volunteers will meet in Myyrmäki campus at room A105 at 07:45. The group have details of events in their Facebook group www.facebook.com/metropoliacharity and one can see their timetable from a Google timetable link. Volunteers are welcome to join and help collect money whether it is for an hour or longer from 08:00-16:00 on Thursday and/or Friday. A number of volunteers have signed up to help and it is a matter of just organising efficient hand over of collection boxes, Red Cross vests etc. The operations Room will be A105 when John Greene is in his office and he will leave instructions on the door when he is in class. Follow updates on Facebook and if you cannot volunteer please show support to the students by joining the Metropolia Charity Group in Facebook, also click that you will be attending the event and please give some spare change to the fundraisers. You can read our earlier Blog posts to learn why we are running this event. Previous Post International Students – Let’s make the best International Day in Myyrmäki Campus history! Next Post Exchange students’ experience in Malaysia.